The 76th Tata Steel Chess Tournament has opened on Friday 10th January 2014 and will officially start from with the first round today at the Tata Steel headquarters in Ijmuiden, Wijk aan Zee. It will take place till 26th January 2014. 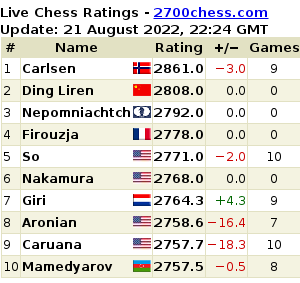 The tournament will see the participation of Levon Aronian of Armenia who is top seed in the Masters Group and Polish GM Radek Wojtaszek, tops the Challengers at the moment. This year’s 76th edition will have two GM groups instead of three, due to cost cutting and the top one has 12 players instead of 14. For the first time since the Tata steel chess tournament started, the grandmasters of the A-group will play one round in the Rijksmuseum in Amsterdam and one round in the High Tech Campus Eindhoven. The organizers of the 76th Tata Steel Chess Tournament have chosen for a mixed group with young as well as experienced, male and female players. Two women who will participate this year are Anna Muzychuk of Slovenia and Zhao Xue of China. Both Zhao Xue and Yu Yangyi will play in Wijk aan Zee for the first time. The youngest players in the tournament are Jan Krzysztof Duda of Poland and Kayden Troff of USA. Duda is a well known name in the field of chess recently as he became a GM and is by now rated 2557 while Troff is the present reigning World Youth Champion U14. Other popular chess players will include the Dutch chess legend Jan Timman, a 2600 player and a regular guest in Wijk aan Zee. He is the oldest participant is the top rated Dutch participant, in advance of Dutch Champion Dimitri Reinderman. The 18-year-old IM Benjamin Bok plans to score his third GM norm. While IMs Merijn van Delft and Etienne Goudriaan qualified from last year's nine-round event.